It was 70° on Saturday. Then on Sunday it turned cold and misty. And today it was colder still with a forecast for snow. It’s springtime in Chicago. A season that always seems intent on doubling back on itself a few times before it settles in for good. It’s a good day for simple comforting baked goods. 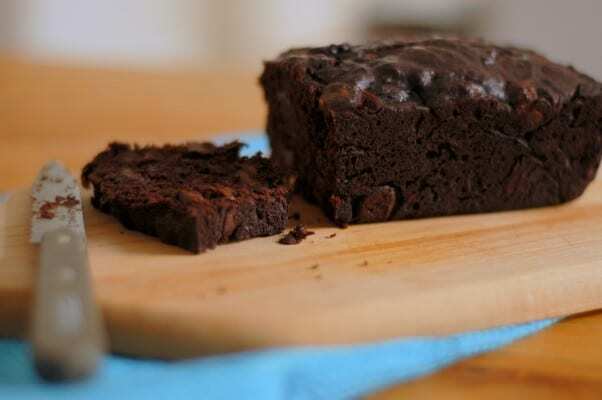 Like this double chocolate banana bread. This comes from Deb of Smitten Kitchen, so I’m pretty sure the whole internet already knows about it. But if somehow you missed it, I’m here to testify to its greatness. Chocolate and banana are a classic pairing–from frozen chocolate covered bananas to banana and nutella filled crepes. I’ve made plenty of banana breads with chocolate chips, but this was the first time I made one where the cake (er, bread) itself was laden with cocoa powder. It’s a simple one-bowl job, as easy as any other basic banana bread. 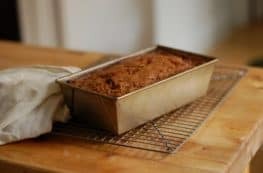 And it might be even easier to love (okay, this brown sugar oat flour banana bread and this streusel topped banana bread might be just as easy to love). It’s rich and chocolatey but the banana flavor really shines through. It’s sweet enough for dessert, but there’s fruit in it (three whole bananas!) so you can justify having it for breakfast as well. I made it in three mini loaf pans and put two of the resulting loaves in the mail to be a birthday treat for my sister-in-law in Kansas. That left one little loaf for me, which wasn’t nearly enough. 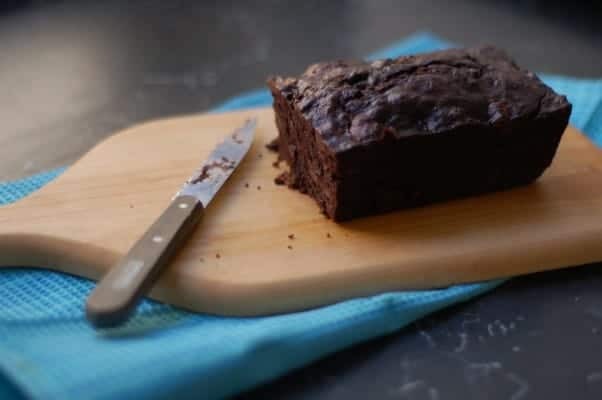 This chocolate banana bread is a snap to make. You’ll want to use cocoa powder that is labeled Dutch-process (sometimes called alkalized) rather than natural cocoa powder here, the latter is acidic and can change the chemical reaction. 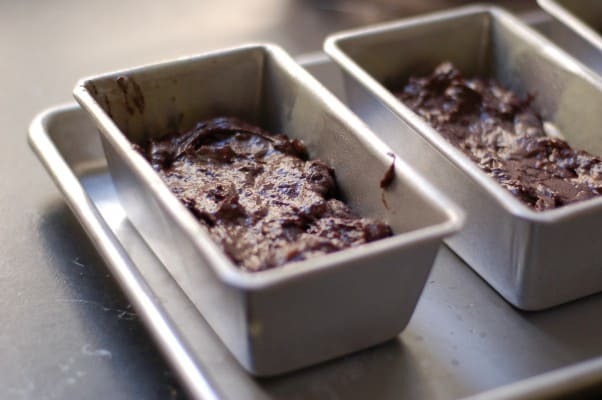 I doubt that most people have mini loaf pans (I got mine from King Arthur Flour and I can no longer find them on the site, but they’re similar to these), so I’m providing instructions for one standard (9″ x 5″) loaf pan. If you choose to make the mini loaves, they take 30-40 minutes in the oven. Preheat oven to 350°F. Spray a 9x5-inch loaf pan with nonstick spray. 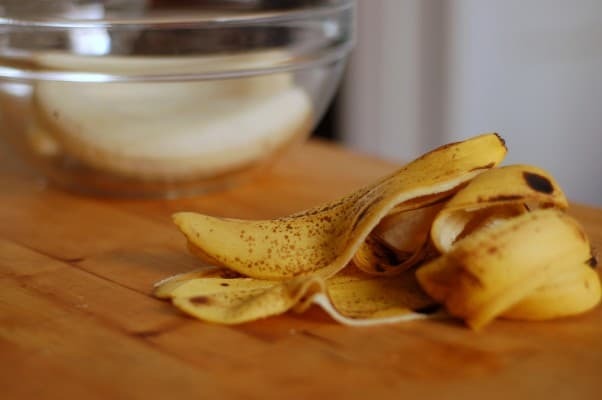 In a large bowl, mash the bananas with a fork. Add the brown sugar, melted butter, egg, and vanilla extract and stir until combined. Place the flour, cocoa powder, baking soda and salt in a large fine mesh strainer and sift over the wet ingredients (cocoa powder has a tendency to be lumpy, so resist the temptation to skip the sifting) and stir until combined. 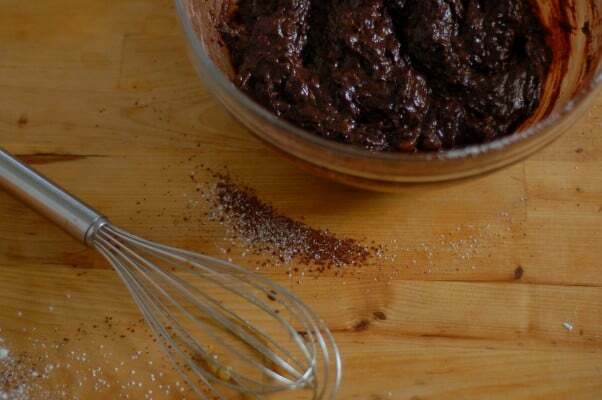 Stir in the espresso powder (if using) and the chocolate chips or chocolate pieces. Pour into the prepared pan and bake for about one hour or until a toothpick placed into the center comes out clean. Cool in the pan on a wire rack for about 10 minutes before inverting it onto a wire rack to finish cooling. Keeps, well-wrapped at room temperature, for up to 5 days. Oh, my, this bread is just delicious! It came out of the oven 30 minutes ago, and I finished my piece, plus the part that stuck to the bottom of the loaf pan, about ten minutes ago. It’s also forgiving—it had been in the oven for 7 minutes when I realized I had forgotten the egg! Took it out, blended in the egg, and no one would ever know of the near disaster. Left out the espresso powder by choice and will add some chopped pecans or walnuts next time. It’s pretty enough for my glass cake stand, and the glistening top is lovely. Thanks for a great recipe. Nancy, I’m so glad you liked it! It’s a flexible recipe, and one that I love.